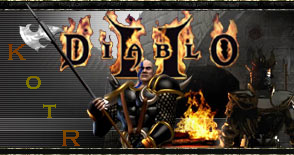 ur Story begins in the time when the earth was black with rage and destruction, the time of DIABLO! The thought of death spread through the lands, but then heros arose from the east! With swords of light and armor of strength, they gave the people of the towns hope in that they would rid this unjustly darkness from the realm! So the Heros set of onto the horizon and fought the demons of HELL that taunted the lands until they had only one left, BAAL! They approched his lair with caution as to try and slay him in his sleep but it was BAAL who was to slay them...or so many thought? But then a most Noble Hero came! His name was GALAXUS and he lead them to battle! They fought greatly, though they lost few soldiers, until BAAL was conquered! And so now they roam the realm of the West for any signs of darkness and, over time, they grew the name that marked them forever! The name was, Kings, Kings of the REALM!!! Kings Of The Realm; Members, Hints, And MORE!